We are glad to announce that the project “Centralbaltic Job Ferry” (CB Job Ferry) has just published the 3rd edition of the Project`s Newsletter. This time you will find information about the latest project research results, including labour market mobility trends in the Central Baltic Sea Region. 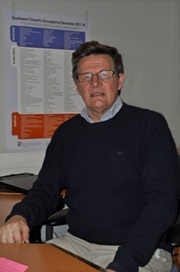 You are also welcome to read the interview with Mr. Jouni Marttinen, Senior Foresight Advisor at the Centre for Economic Development, Transport and the Environment (ELY Centre) for Southwest Finland, discussing a useful tool for labour market anticipation – Occupational Barometer. Another European project dealing with social inclusion and labour market issues – “Innovation Strategies for Equal Employment – Labour Plus” is also presented in the current publication. If you are interested in upcoming project events, please, see the project Events’ Calendar at the end of Newsletter. Dear Readers, we would like to inform you that the CB Job Ferry web platform will be launched during the project workshop in Stockholm on August 28, 2012. The public presentation of this platform and the press conference will take a place in the framework of the Central Baltic Project Open Days 2012 event in Riga, University of Latvia, on October 11, 2012, from 10.00 to 12.00. You are kindly invited to participate in the Riga event “Information on job profiles to promote cross-border labour markets’ mobility – Launch of the Centralbaltic Job Ferry platform”! Prior registration for the event is required (Please see project Events’ Calendar at the end of this Newsletter). The project`s Newsletters regularly inform its readers about upcoming events and developments within the “Centralbaltic Job Ferry” project. In order to maintain close communication with all labour market players, we would appreciate also your contribution to the implementation of the project. Please, contact the project staff to contribute to the project by giving your comments and advices. Your contribution would help us to build as up-to-date and as relevant information platform as possible. We express our sincere gratitude to all the project supporters and experts that kindly shared their experiences and visions during the project research phase. You can also follow us on Facebook – http://www.facebook.com/CentralBalticJobFerry. If you have problems with viewing all the contents of this newsletter correctly, click here. This article synthesises preliminary results gained during the research phase within the “Centralbaltic Job Ferry” project. The research phase combined both quantitative and qualitative analysis. In the first round of the research literature review and official data sources were used to map the labour market situation in each country. The second round comprised 60 interviews with representatives from national and regional labour market institutions. The Central Baltic region is home to some 10 million people. In demographic terms people’s mobility is one of the major issues in the region. Economic restructuring and economic problems in the Baltic countries have stimulated cross-border labour market mobility to Finland and Sweden. Potentially higher salaries in Finland and Sweden remarkably influence the cross-border labour market mobility. In this regard the direction of the labour market movement in the Central Baltic programme area will not change considerably in the near future. Cross-border labour market mobility within the Central Baltic region has allowed more efficient matching of employees’ skills with employment opportunities. However, it has also aggravated the internal labour market situation in Estonia and Latvia, but at the same time labour market mobility has also offered possibilities for individual employees and facilitated general up-skilling of their qualifications. In the upcoming years a labour shortage is expected in quite some sectors across the region. CB Job Ferry project aims to increase cross-border mobility in all the countries of the region by mapping potentially demanded jobs. However, there are a number of obstacles existing that still hamper cross-border labour market mobility such as language skills as well as availability of information about the recruitment process, legislation and tax system, labour market regulations, qualifications and their appraisal in another country. There is a need to link different information sources of labour market and to coordinate the actions of various parties in the labour market. Lack of up-to-date information about the cross-border labour mobility does not only refer to foreign job-seekers but now also to employers. Companies face difficulties in finding accurate labour market information as well. Within cross-border labour market mobility it is of paramount importance that education and qualifications of job seekers are recognised by potential employers. There are no general rules about the recognition of foreign qualifications and validation of learning experiences between the countries. Basically there is a great need for ‘translation scheme’ between national qualification systems and regulations. It may be appropriate for cross-border job seeker to have not only a certificate but also a more detailed description about the actual content of the education/training. The positive and negative effects of growing cross-border labour market mobility mostly depend on whether labour mobility is temporary or permanent. Returning migrants may offer a boost for economic growth as they bring home skills, capital and new ideas obtained abroad. There is a possibility that return migrants will compensate the original losses caused by growing cross-border labour market mobility. Since the end of 2008, the situation in the Latvian labour market has become increasingly sluggish. With one of the highest economic downturns in Europe labour demand reduced substantially thus decreasing job vacancies while unemployment experienced a sharp rise. During recovery additional labour market boost can be expected. However, there is a great chance that the labour demand will arise in different new sectors, but not necessarily in the same areas where it was high before the economic crisis. For example, the world’s largest workspace solution companies “Regus” predicts that in the future the labour mobility will increase while domestic labour will decline. Mr. Michael Aastrup, „Regus” Area operations director in Nordic countries and the Baltic States, in his interview with the business website “nozare.lv” stressed that a number of mobile workers in the Baltic States has been increasing1. Latvian ICT industry representatives, similarly to those in Estonia, point out that there is already shortage of the ICT specialists. One of the reasons that cause the shortage of ICT workers is that there are not so many young people in Latvia who choose to study IT. Recent data shows that there were 269 vacancies at the ICT industries branches registered in June, 2012, in one of the largest Latvian job search engines “CV Online”. Latvian Information and Communications Technology Association (LICTA) say that the overall number of information and communication technology branch employed has reached 17,900. The share of employees in ICT sector in Latvia is smaller than in countries with large ICT industries, such as Finland, where more than 100,000 inhabitants out of a total population of 5.4 million people are employed in the ICT sector; 10% of them are employed by the “Nokia”. The LIKTA’s president Ms. Signe Balina has stressed that there is a lack of young people who would like to study IT. Moreover, the lack of IT specialists is a problem all over the Europe, because the number of IT students in other countries is also decreasing. Nonetheless, around 18% of students in Europe are still studying information technologies, compared to only 5% of students in Latvia. Labour mobility at a regional level in Latvia is, of course, more topical in border regions, for instance, in northern part of Latvia that is closer to Estonia and in eastern part that is closer to Russia and Belorussia. Also in the south-western part of Latvia near the Baltic Sea labour mobility is relevant in certain labour market sectors, e.g., fishing industry and, in particular, fish processing. At the central part of Latvia, however, the perception of labour mobility in terms of incoming labour force is slightly different – it might be more difficult for foreign job seekers to find a job at the central part of Latvia since the vacancies at vast majority is filled with local workers, thus maintaining one of the lowest regional unemployment rate in Latvia. As for the sectors with the highest demand of labour at a regional level few can be mentioned – in central and northern parts of Latvia most popular sector among men is wood-working industry while most of women tend to be employed in trading sector, in particular, sales. In western part the metal-working is more developed as well as a little of fishing industry. Also building and construction sector is recovering after the economic crisis. Overall, despite the quite high unemployment rate in 2010, 2011 and 2012, in upcoming 3-5 years it is expected that the risk of labour shortage might appear in quite a many sectors influencing the need of both lower and higher qualified workers. A recent analysis by the Estonian Development Fund reveals that Estonia needs up to three times more ICT specialists in order to ensure development of the sector2. Based on the analysis carried out by the Institute of Baltic Studies, there are a lot of job opportunities in the ICT sector for both domestic and foreign workers. The ICT sector is seen as a key strategic development area for the future of Estonia. Therefore, this has been chosen as one of the focus areas in the framework of the CB Job Ferry project. According to expert estimations, around 7000 ICT-specialists currently working in Estonia can deal with the existing workload, but these human resources are highly insufficient for the further development of this sector and for achieving its ambitious growth targets. The biggest demand of the ICT sector is for qualified and experienced specialists with higher education background. Representatives of large IT companies have outlined a clear lack of IT architects and network experts. According to main job search engines in Estonia, the most of vacancies in the ICT sector are for the following professions: system analysts, software developers, ICT operations technicians, and ICT user support technicians. This high demand of ICT sector can be explained by constantly increasing role of the ICT in all spheres of life as it’s development is very much linked to increasing application of ICT in various other sectors. While some of the growing demand for additional ICT specialists can be covered domestically since the ICT community is working very actively to foster technology-oriented mind-sets and higher quality ICT-education and training still a lot of opportunities in this sector exist for foreign specialists as well. The study by Turu-uuringute AS in 20113focusing on the Estonian employers’ estimations related to current and future needs for foreign labour reveals that the ICT is one of the most relevant sectors from the perspective of cross-border labour mobility. In addition, engineering and business services – sales and export managers/specialists, financial specialists – were mentioned as additional professions which are highly demanded and where vacancies could be filled by foreign specialists. 2Estonian Public Broadcasting News (2012) „IT Sector Needs Up to 3 Times More Specialists“. Available at:http://news.err.ee/economy/4e36cc73-e95a-454a-a07d-9f69ae93d814, 7 June 2012. 3Turu-uuringute AS (2011) „Study on foreign labour demand”. The following article is based on the interview with Mr. Jouni Marttinen, Senior Foresight Advisor at Centre for Economic Development, Transport and the Environment (ELY Centre) for Southwest Finland. He has been a central figure in developing an anticipation tool for labour market called the Occupational Barometer. Since this tool has awoken remarkable interest in Finland, as well as in international arena, we decided, on behalf of CB Job Ferry project, to attract attention of anyone who is interested in the labour market anticipation. This article has been shortened. Please, read its full version by clicking on the link provided at the end of this text. It was in 2006, when the Employment and Economic Development office in Turku was implementing a project by which a team of EURES advisors wanted to enhance labour mobility across the regions of Turku in Finland, Ahvenanmaa (Åland), and Södermanland in Sweden. At that time, there was a substantial shortage of labour in Turku area, e.g. due to positive developments of the shipbuilding industry in Turku. Knowing that Finns formed some 15 % of the population in Eskilstuna, the capital city of Södermanland region, it felt feasible to think that some of them might be interested to move back to Finland now that there were plenty of vacancies. Nevertheless, Mr. Jouni Marttinen who was working as a researcher started to compile statistics about the employment rates, vacancies and other relevant data on employment situation. During the implementation of project the team got familiar with the Swedish way of handling employment issues and they found out that Swedes have published a poster with a list of occupations presenting the employment situation by the three categories, i.e. shortage, surplus and balance of labour. “We thought: why don’t we start to develop a similar thing in Finland”, Mr. Marttinen recalls. Keeping this in mind Mr. Marttinen together with two EURES advisors went for a study tour to Eskilstuna in 2008 to learn from experience acquired during the Swedish labour market anticipation processes. This was the benchmark for the Finnish team and consequently they decided to copy the idea and develop it further. A team of five or six people in ELY Centre Southwest Finland started the work and other ELY Centres gradually joined in the work process. By the end of 2010 there were ten ELY Centres involved in the labour market anticipation process. Also, the Finnish Ministry of Labour and Economy got involved in the process. Finally, the first nationwide Occupational Barometer was produced in the spring of 2011. At present, the complete database is available only for the ELY Centres internally. However, in the near future, possibly by the end of 2012, it will be published on the Internet. Before launching the database on the Internet all fifteen Finnish ELY Centres are distributing posters in their regions which provide the information on occupations according to three categories, i.e. shortage, balance and surplus of jobseekers. Also, more specific reports can be found on the web. As soon as the complete database will be on the Internet anyone will be able to use the search engine to prepare report according to own requirements. 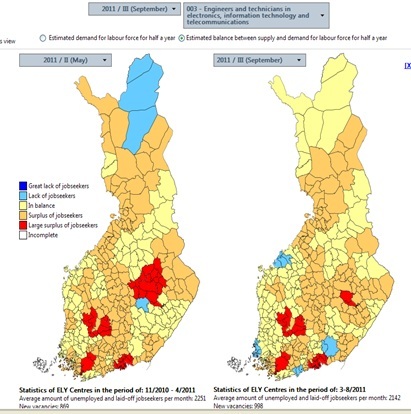 For example, a person can download a map of Finland where the shortage, balance and surplus areas are reflected by five colours (see example below). At the moment all these reports can be downloaded in Finnish, Swedish and English. According to the project’s vision this system will be spread, wherever possible, all over Europe. There will inevitably be differences in ways of data gathering and its accuracy, however the system itself does not require numeral data but just estimates which can be based on available statistics and personal view of some experts. Once spread all over Europe a common database can be established to let anyone see the labour market overview anywhere in Europe. In 2006, Mr. J. Marttinen started international cooperation with Polish authorities. As a result of successful cooperation in 2010 the first Polish Occupational Barometer was produced in Małopolskaregion, where Krakow is the capital. Since then they have decided to publish the Occupational Barometer once a year and for the time being it has been done by totally manual method. The Occupational Barometer has received a high recognition in the ARENAS project carried out from 2008 to 2010. This project presented the foresight practices and methods by which the social restructuring will be anticipated and managed in each of the 27 EU countries. One of the interesting outcomes was the mutual view that the Finnish Occupational Barometer should be introduced in all three Baltic countries for two reasons: it is functional and it is relatively easy to adopt (source: Synthesis Report: Social partnership for anticipating change and restructuring. 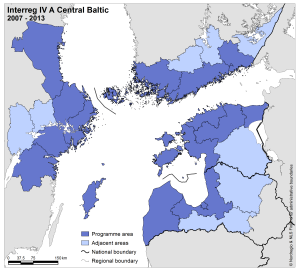 Mutual learning: Finland and the Baltic countries – Nov 2011). The Occupational Barometer system has also been recently presented to representatives of Eesti Töötukassa (Estonian Unemployment Insurance Fund). The future will tell if Estonians will be interested to introduce this system. Also, a delegation from the Petrozadovsk State University visited Turku to get to know the Occupational Barometer. As a result, they have recently informed ELY Centre that they are planning to implement this system in their region as well. • Labour market analysis, the prospects of occupations, shortages etc. Mr. Marttinen considers that the shortage of labour is an unbearable loss of opportunity and, therefore, he emphasizes the importance of using tools like the Occupational Barometer to target the vocational and adult training related to occupations experiencing the greatest shortages. The functionality of the database is being developed by adding links to relevant data sources. The website provides a link to the site of job vacancies published by the national authority and there will also be another link to the information on training programs related to each profession and occupation. Another important task is to promote the system to make sure that all interest groups have received information and have access to the system. Of course, publishing the system on the internet will considerably enhance the distribution of information. For example, there are certain professions within social and health care sectors which have an increasing shortage of labour. It is important that those who make decisions about different study programs and a number of new students in different sectors are aware of labour market situation and make sure that employer’s demands have been taken into account. The Finnish ELY Centre has also arranged labour market anticipation forums to enable employers, educational institutes and authorities to work together in order to identify what is being done and what are the needs and prospects of different sectors. For example, logistics and ICT sectors have their own forums` meetings once or twice a year. Among other tools and methods the Occupational Barometer is used for describing current situation in the labour market. At the same time these forums provide a good chance to coordinate the analyses of the labour market and to avoid duplication of work. We should take into account that the labour market tool discussed here is just one element for the analyses and anticipation of activities in Finland`s labour market. The Occupational Barometer is a short term anticipation tool, but long term anticipation methods are different. They require patient effort for setting up long term cooperation with various institutions, such as research centres of universities. In spite of the fact that the Occupational Barometer is by no means the only thing that needs to be used for the labour market forecasting, it has a couple of features worth mentioning: firstly, as explained earlier in this article, it has been also implemented in Poland, i.e. in a very different environment; and secondly, it is very easy to use, simple tool which can be used for multiple purposes. The Finnish ELY Centres are willing to help the neighbouring countries to adopt this system, preferably as much as possible in the same format as it is implemented in Finland to facilitate the labour mobility between different regions, and even across the borders. Download and read the full version of article here. The Centre for European and Transition Studies (CETS) at the University of Latvia (UL) has become a partner in a project that will help to facilitate the integration of immigrants and minorities into society and labour market together with eleven project partners in Europe. The project named “Innovation Strategies for Equal Employment – Labour Plus” is planned to be implemented in the ten EU partner countries – the Netherlands, Italy, France, Latvia, Spain, Belgium, Hungary, Germany, United Kingdom and Bulgaria starting from January 2012 until December 2014. During the project implementation the following activities have been planned: the analysis of the best immigrant integration policies and methods in different countries, exchange of experience through study tours, research on particularly vulnerable society groups with the focus on immigrant and Roma communities, as well as the identification of main social exclusion problems and discussion on new immigration policy development. One of the main project aims is to prevent the social exclusion of particularly vulnerable society groups in the labour market. “The main role of the Latvian project partner is to support the implementation of the research, to participate in all project activities, as well as to learn from the experience of other countries in immigrants’ integration into the labour market. According to the prognoses of the Ministry of Economics the integration of immigrants in Latvian labour market might become important after the year 2016 when labour shortages in certain sectors might arise. Also, we hope that this project will help us to stimulate the integration of young people into the labour market more actively. Facilitating the employment of young people is of a great interest for Latvia”, emphasised the Project Coordinator in Latvia, Mr. Romans Putans. Representatives of the Centre for European and Transition Studies (CETS) of the UL took part in project meetings and seminars in the Netherlands in April 2012, and in the province of AltEmporda in Spain in June 2012. During seminars project partners shared their experience about immigration policies and inclusion of minority groups in social sphere, in particular, in labour market. CETS representatives also presented the best practise example of Latvia’s successful Roma community integration projects. From comprehensive experience sharing during these seminars, it can be concluded that one of the best tools to secure a successful integration is an individual approach. This has worked successfully in the Netherlands, where Roma community families were offered consultations by a mentor of the local municipality. The role of the consultants/mentors is to help elderly family members to participate in labour market and to encourage parents to get an education for their child ren. Currently, project partners are working on the identification and researching of the best practices related to the use of integration policy instruments, which will be discussed at the next project meeting in Marburg, Germany on 8th to 9th November 2012. Riga, LatviaThe event will take place at the main building of the University of Latvia (Riga, Raina Blvd. 19) from 10.00 to 12.00. (Please register for this event before October 7th, 2012 by contacting Ms Denize Ponomarjova, denize.ponomarjova@lu.lv).